Last week as part of our celebration of the FIRST BIRTH at Strong Start Maternity Center (hip-hip-hooray for healthy baby Stanley! 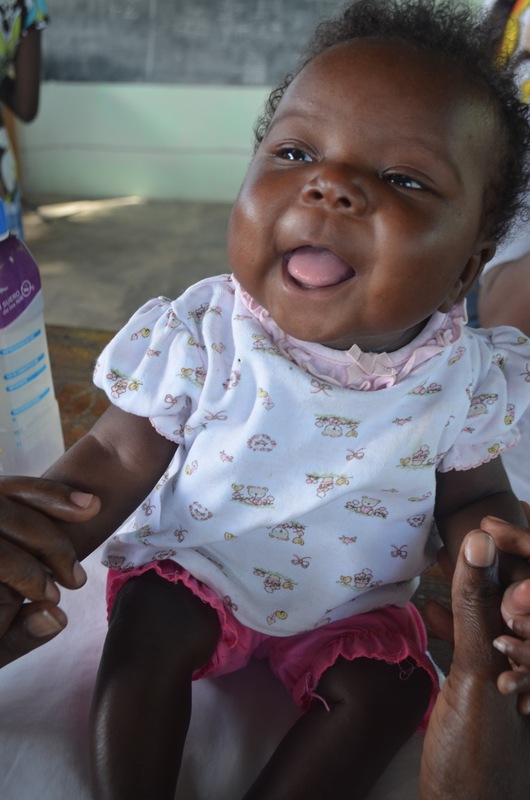 ), we asked YOU what you would like to know about Second Mile Haiti'’s relatively new maternal health program. You asked some great questions, so let’s get to them! Q: How many pregnant women are currently on the waiting list to give birth at Strong Start Maternity Center? A: There are currently 76 women on the calendar set to give birth in the next nine months. This number will likely keep climbing every month until we hit our maximum capacity. We are committed to serving as many women as we can while maintaining the high standard of care. Shout out to our Fierce Community whose support makes this all possible! Q. How long will women receive care after their birth? A: When women come to Strong Start Maternity Center in labor, we support and monitor them through their labor and assist them as they give birth. After baby is born, we encourage the mother to stay at Strong Start for a minimum of 24 hours. After that period, if everything looks good, we send mom and baby home. If there’s a problem, we keep monitoring them at our center for 72 hours. If they have complications that require them to be transferred to a hospital during this time, we transfer them. Q: How do Strong Start Maternity Staff respond in the case of complications? What is the plan in the case if emergencies? A: We have a comprehensive list of criteria to determine when we would transfer a woman to a hospital. This could happen during the course of prenatal care, such as in the case of preeclampsia or severe anemia. Anytime there’s an emergency during labor, we have our transfer vehicle on site and all of our staff are trained on the emergency plan, from making sure the driver gets notified immediately, to putting the oxygen tank in the car, to grabbing the emergency birth kit so that we can monitor the woman’s vital signs and potentially deliver a baby in the car. All of the nurses and midwives are trained in best practices in monitoring so that we can anticipate problems and act quickly if it becomes clear that a women will not be able to give birth with us. The hospital where we transfer women, Hospital Sacre Couer, is a reputable hospital about 15 minutes away where we have great relationships with doctors and staff. For each case, we call them in advance so that the woman gets checked into the hospital with all of the relevant information that we have on her case. Obviously we hope that hospital transfers don’t need to happen often, but we are well prepared and connected for when they do! Q: Do women served at Strong Start Maternity Center also receive educational classes like caregivers at the Malnutrition Treatment Center? Are these women also supported in starting businesses? A: Women who come to the Strong Start Maternity Center do not receive business kits, but we do offer educational opportunities at Strong Start for women who come for prenatal care. Throughout their pregnancies, these women have access to a series of prenatal classes. There are eight subjects in total, and each Thursday we cycle through one of the eight subjects. Women keep a punch card so that they can keep track of the number of classes they have attended, and this corresponds to slightly discounted rates for delivery assistance at the Center. The regular price for birth care is 500 gourdes (just over $6 US). The discounted rate for women who attend at least four prenatal classes is 400 gourdes (just less than $5 US), and for women who attend all eight classes, it is reduced to 300 gourdes (or $3.70 US). We believe that most women would opt to attend as many classes as possible regardless of the discount, but we like to sweeten the deal as an extra incentive to attend all eight classes. The discount may also serve as a “good excuse” for women who have many other responsibilities and family pressures. Pregnancy 101: The adults who enter Second Mile Haiti’s centers average a third to fourth grade education level, so many missed the classic sperm-meets-the-egg talk. In this class, we talk about what to expect during pregnancy, the biological processes that lead to conception, and everything that’s happening during the body during pregnancy. Prenatal care: In this class, we demystify the care that women receive during prenatal visits by explaining what kind of care women will receive during prenatal visits and why. We go over what to expect during an ultrasounds; why we preform various tests, and what we will do to provide care or transfer to hospital in case we find an issue through these tests. Protecting yourself during pregnancy. In this class we go over danger signs, how women can identify if they are experiencing these signs, and how they can get help if they are in danger. Nutrition and pregnancy: Here we talk about how paying attention to what women eat while they’re pregnant can give their babies a strong start and keep mom healthy! Preparing for delivery: In this class, we go over what to expect throughout the process of labor and share some techniques for dealing with the pain of labor. This is also a great chance for first-timers to learn from the stories and experiences of other moms who have been through it before. Nourishment for newborns. In this class we look at everything that baby will need in his or her first days and months out in the world, and of course, the wonderful and wild world of breastfeeding. Early care for newborns. Any mom can relate to the question: What do I need to do for my baby when they’re first born? And what do I do if something goes wrong? In this class we answer those questions and identify signs that a baby is sick and needs care. The postpartum period. Lest we forget this extremely important topic! In this class, women learn practical tips and tools on how to best take care of themselves after their birth, plus suggestions that they can share with friends and family who are available to help out. We also go over postpartum depression, family planning, and what to expect when becoming sexually active again. Q: What are all of the prenatal services that women receive at the Strong Start Maternity Center? All of the prenatal services that we provide at the Strong Start Maternity Center are intended to give each woman a strong foundation of health and knowledge so that she can keep herself and her child as healthy as possible. Aside from offering a woman the series of eight educational classes described above, we also perform lab tests for hemoglobin, STI’s, and UTI’s; we check her weight and blood pressure; we predict her due date through ultrasounds; and we check the woman’s fundal height (aka belly size) to make sure baby is growing at a healthy rate. Women also receive vitamins and family planning services. This is all done to identify any complications as soon as possible and to make sure that each woman receives the proper care for her unique pregnancy. If we do identify complications, we can treat many of them in-house at the Strong Start Maternity Center. We regularly treat UTI’s, STI’s such a syphilis for the women and her partner(s), mild to moderate anemia, high blood pressure due to chronic hypertension, and mild to moderate malnutrition. Women with malnutrition receive the nutritional supplement Plumpy’Sup which is similar to what malnourished children receive at Second Mile’s Treatment Center. Some complications necessitate transfer to a hospital, which we facilitate. We refer women to hospitals for HIV/AIDS, severe anemia, severe malnutrition, or preeclampsia. Q: How do women in need of your service find you? A: At the very beginning, Second Mile Haiti staff did walk-throughs in surrounding areas to let people know that we were about to open the Strong Start Maternity Center and to give information about the hours of operation. We also posted a few signs in nearby communities that remind women of the three days of the week that we’re open for prenatal visits. Since then, women let each other know through word-of-mouth. We keep receiving more and more women each month, so our relatively passive marketing strategy seems to be effective! Q: How can I support the Strong Start Maternity Center? I’m glad you’re asking! There are a few things we need your help with. We need more supporters to give monthly. I said there were a few things we needed your help with but… really it comes down to just one. We still need 23 friends to join the “Fierce 40.” The Fierce 40 are monthly donors who give any amount of their choosing each month to sustain the services we provide at the Strong Start Maternity Center. If you see the value in the services we provide and think that women in Haiti should have access to these services, please join the Fierce 40 today! We couldn’t do this without your support. Thank you! You may have seen some articles, or at least Facebook updates, on the situation in Haiti. Thank you to everyone who is paying attention to what’s been happening and to those checking in on the Second Mile Haiti team. Here is a brief update on the civil unrest that has the country on lockdown and how we’re coping at Second Mile Haiti. Protesters have been demonstrating against government corruption, gas shortages, a devaluating national currency, and a spike in prices for basic goods like rice. For the past ten days, these protests have blocked many major roads, most businesses have been closed, and most citizens who are not protesting have sheltered in place. At this point, there is little electricity, gas is hard to come by, many people are running out of drinking water and food, and people cannot afford to eat. The Second Mile Haiti staff sprang into action on the protests’ “rest day” to purchase supplies that will be used at the Treatment Center and the Maternity Center. Jacqueline Charles, one of the leading journalists on Haiti, wrote that the situation is affecting many hospitals, and that women with complicated pregnancies are especially vulnerable at this time. Government hospitals have gone on strike for lack of pay, and many international aid agencies have evacuated. 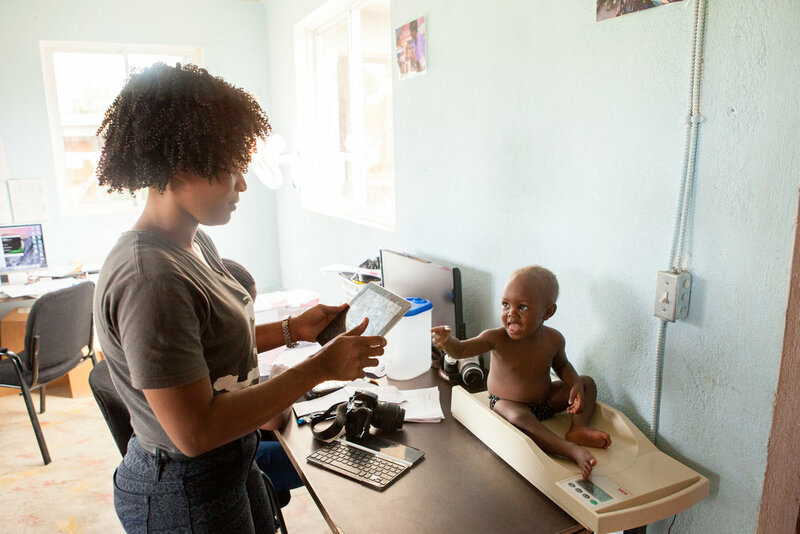 Among many very serious issues facing Haitian people in this moment, pregnant women and sick children are particularly vulnerable because there are more barriers to accessing care than usual. The U.S. State Department issued a Level 4 “do not travel to Haiti” advisory for U.S. citizens. The Canadian Embassy evacuated over 100 Canadian citizens via helicopter. We certainly agree that it is better to err on the side of caution and to ensure safety. Here in Northern Haiti, we are taking the precautions that we feel are necessary while remaining on the ground. Second Mile Haiti is not struggling in the same ways as other organizations when it comes to electricity since both of our properties are 100% solar. This has allowed us to keep the centers open. However, our employees have had difficulty coming and going both because of road blocks caused by protestors and because transportation options are limited due to extreme gas prices. Last week, we strategically picked up our program managers, psychologists, and nurses so that we could keep programs running. But on Tuesday of this week, in light of all the blockades and increasing uncertainty about whether protests would become more heated, we made the decision to send all the nutrition center beneficiaries in the residential program home with provisions to be able to continue their care from afar. The Strong Start Maternity Center has seen a record number of prenatal visits these past ten days, which just shows the extent to which expecting mothers will sacrifice to ensure their pregnancies are on track. Some women have had to arrive on motorcycles through roadblocks, while others have walked. In a situation where so many hospitals and clinics are closed or inaccessible, we are thankful that we are able to continue providing care at the Maternity Center. During the week of lockdown, women have been getting creative with transportation to the Strong Start Maternity Center, doing anything necessary to make sure their pregnancies are on track. Here women ride in a truck that will only be able to take them so far on backroads before they reach roadblocks and have to descend on foot. Saturday was a “rest day,” which meant that the protests slowed down to allow for people to get supplies like food and water. The Second Mile Haiti team sprung to action early this morning to purchase food, medicine, formula, and even some construction materials. Protests are expected to pick up again tomorrow and last through the week. For those who have been asking how they can support Second Mile Haiti at this time, we don’t need emergency materials or funding (and hopefully things will not escalate to that level), but we have been asking people to sign up as monthly donors to support the costs of running the Strong Start Maternity Center. Monthly donations help us to remain a constant presence and care provider in Northern Haiti, in times of peace as well as times of struggle. We will do our best to keep everyone updated as we continue to provide care for women and children in Northern Haiti. 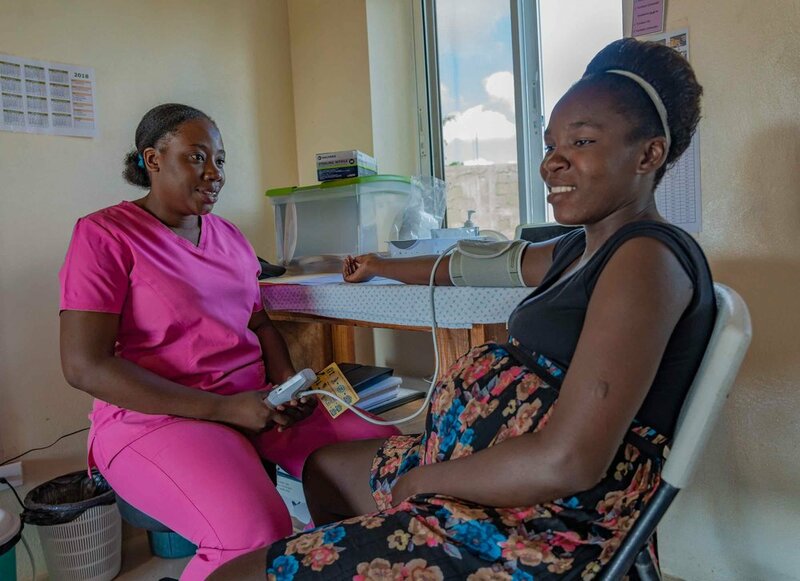 While many hospitals and clinics were closed or inaccessible due to the “lockdown” in Haiti in February 2019, the Strong Start Maternity center received a record number of women coming in for prenatal visits. 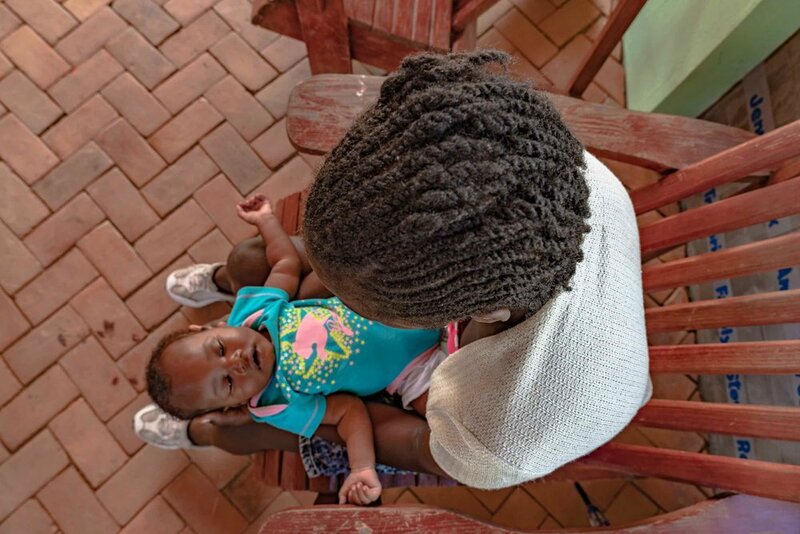 At the Second Mile Treatment Center, we receive all types of caregivers: aunts, dads, grandmothers, cousins, and other family members who keep and care for children who are recovering from malnutrition. In celebration of the Strong Start Maternity Center starting to host births this month, we want to focus in on mothers. Last year, 83% of the caregivers at the recovery center were moms. These are women fighting for their children. They excelled in the program and made incredible steps to absorb all of the education and opportunity given to them. They left the center ready and excited to keep and care for their kids. These are the stories of three of these superhero moms. Mom 1: Meet 27-year-old Rosenie. She and her daughter, Fabiola, came to the center after spending eight days in the hospital because Fabiola was severely malnourished. Rosenie has four children of her own but cares for a total of seven. When she came to the center, she had only finished one year of school, meaning that she never had the opportunity to learn to read and write. During their stay, Rosenie learned a lot, asked questions, and played the primary part in her daughter's recovery. 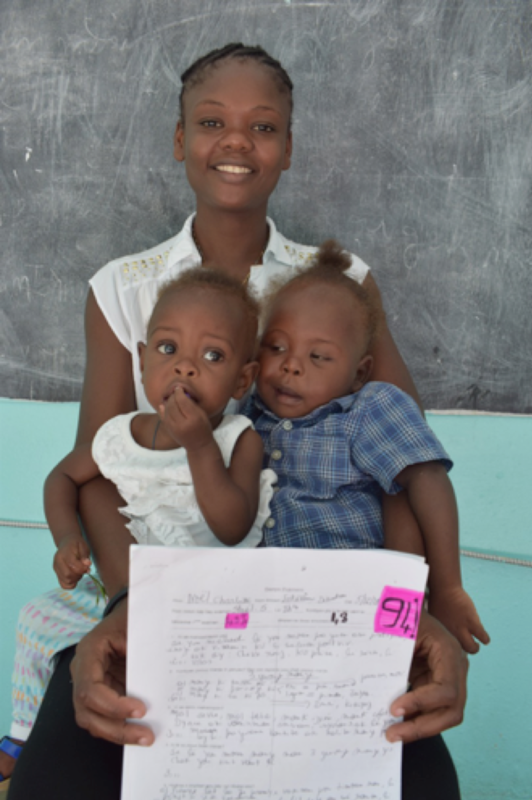 When they left to go home, Fabiola had gained four pounds and Rosenie scored a 96% on her exit exam, a 67% increase from her initial score! "She didn't walk, now he walks. She wasn't developing, now she has made a lot of progress. She used to cry, now she plays and smiles." Fabiola and Rosenie received their first business package just before the holidays. This family is ready and equipped to have a strong 2019! Mom 2: Meet Charline. She is the Mom of Dieudeson, a two-year-old who spent five weeks at the center last year. When they arrived at the center, Dieudeson was sick, and it had been over a year since Charline had been able to gain regular income. Charline has another child as well as Dieudeson, and was struggling to provide for them. 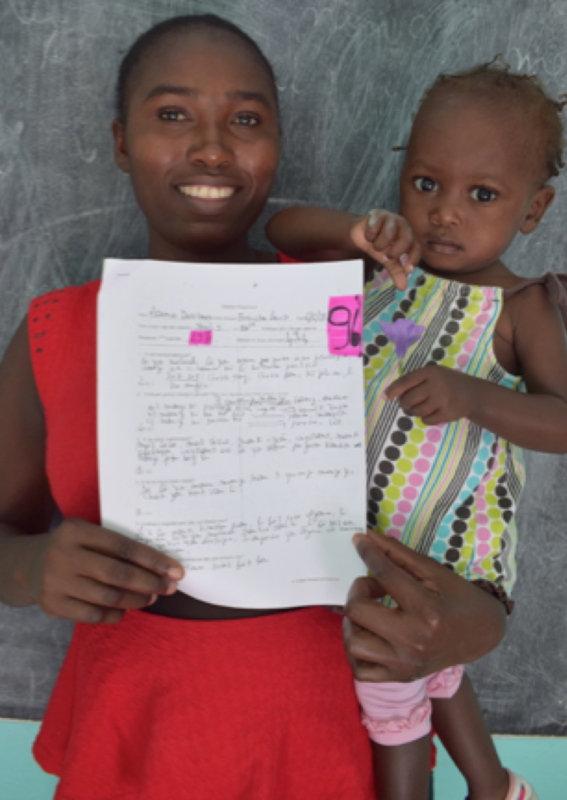 When she arrived, she scored a 48% on the entry exam (which is completely normal given that quality education can be hard to come by in rural Northern Haiti), but after her time at the center, she graduated with a 94%! Charline sees so much change in Dieudeson, and we can see so much change in Charline. This family of three recently received their first income generating business package, which Charline will put to good use to reinforce the positive changes she’s seen in her child. "Dieudeson’s hair was red and dry, but now it has returned to normal. His stomach, feet, and face were swollen, but now they are normal. He had a fever all the time, but now he feels well. Now he is smiling and playing as he should be." Mom 3: Lastly, meet Julande, the 18-year-old mother of Judelin. Before having her son, she was a student. She loves to learn! When she arrived at the center, her son was just one month old and severely underweight. When they arrived, little Judelin needed to go to the hospital to be seen by a doctor and have some blood tests done. Mom was exhausted and struggling, and Judelin was too. They graduated from the recovery center with Judelin weighing almost 10 pounds (an 80% increase from his entry weight)! And the icing on the cake: Julande scored 100% on her exit exam! They received an income-generating package this month which will help this motivated young mom to earn money and save for their future. "Second Mile helped me to cover Judelin’s hospital bills and to get all of the care that we both needed. I found education, milk for my child, food for myself, and a secure place to sleep. He wasn't developing as he should for his age - he was tiny. Now he is gaining weight, developing, and he even smiles!" We say BRAVO! These women have walked a hard road. They're overcoming poverty, illness, lack of access to education, and SO much more. We will ALWAYS be here to provide services for moms and other caregivers who need help caring for their children. But we have another vision: a future where moms like Judlande, Charline, and Rosenie don’t need Second Mile’s Treatment Center, because their children never become malnourished in the first place. Right now, you can help make this vision reality by becoming one of our fierce, monthly supporters. If you want to see healthy moms give birth to healthy kids (that stay healthy) this opportunity is for you. Starting February 25th women who had low-risk pregnancies will have the opportunity to deliver their babies at Strong Start Maternity Center. For the past 11 months, women have been coming to the Maternity Center with the goal of keeping themselves and their soon-to-be newborns healthy and safe. Now, these women will get a chance to see their newborns into the world here, in the presence of skilled midwives, in a facility committed to care for them with the utmost compassion and respect. It’s going to be beautiful and hard, messy and glorious. We want you with us. And we need you with us. Help us reach our goal of 40 new Fierce Partners before February 25th. 2018 Impact Report is Live! Check out Second Mile Haiti’s 2018 impact report. Thank you for making it a year of growth! It’s been another 365 action-packed days around the sun! Here in Northern Haiti, the Second Mile team is still basking in that sentimental feeling after getting some much needed rest and family time during the holiday season. We feel grateful for the privilege of taking time at the end of each year to reflect, reinforce our relationships with family and friends, relax, and prepare for the work to come. And from our recognition of that privilege comes a sense of urgent responsibility. At Second Mile Haiti, we feel that it is our responsibility to use our skills and resources to expand access to the same rights and privileges that we have. At the very least, sick children should be able get the rest they need to recover, and families should be able to stay together throughout their most difficult times rather than forced apart. And access to quality healthcare should be a right for all so that kids never have to experience malnutrition in the first place. We have a long way to go before the biggest worry for most families in Northern Haiti around this time of year is what New Year’s resolution to adopt. But with your sustained support, change is possible. Piti piti. Little by little. We’re already racing into 2019. A fierce group of supporters decided to stand with women and families by signing on as monthly donors to support the Strong Start Maternity Center. Because of their tenacity and commitment to maternal and infant health, they are known as the Fierce 50! Thanks to the support of the Fierce 50 and other generous contributions, we finished phase one of the Strong Start Maternity Center and started accepting patients for prenatal care, holding education classes, and offering expecting parents other holistic health services such as psychological support. It’s a landmark accomplishment for us to be providing women the care they deserve while helping them give their children a Strong Start. 234 were served at Strong Start during the last nine months of 2018. Our staff grew from 28 to 38! We’re proud to be providing local employment for skilled health services professionals like skilled birth attendants, nurses, and psychologists, as well as operational technicians, gardeners, and… how would we describe Blaise? Chief-yogurt-maker-entrepreneur-biologists. Three of our newest team members are phenomenal midwives who are now the backbone of Strong Start's maternal health program. These Haitian midwives are bringing their strong backgrounds in Maternal Health, coupled with the continuing education and additional training they received this year to improve outcomes for mothers and their babies. Our adult education programs now have more livelihood opportunities that are specifically tailored to the needs, strengths, and interests of each individual. New customized business plans integrate animal commerce, husbandry, and agricultural classes that help adults maintain income streams and access to healthy food all year round. Thanks to our dedicated staff and to amazing supporters like you, 105 children recovered from severe acute malnutrition and 138 critically ill children had their medical expenses paid. That definitely has us feeling good about 2018. If you are a Second Mile Haiti supporter, YOU made these highlights possible. From all of us here at Second Mile: Mèsi! / Thank you! Thank you for standing with Second Mile Haiti to keep families together and help women and children thrive. We are so grateful for all the many ways you supported kids, parents, and communities in 2018; and we look forward to another exciting year together! We will finish up construction of the postpartum unit at Strong Start Maternity Center and expect the first birth in February 2019! Throughout the year we will support hundreds of women in giving birth safely at the Birth Center. You know that unmistakable new baby smell? Not to sound weird, but we’ll be getting a lot of that this year. We’ll be purchasing a “tap-tap” (a retrofitted truck taxi) from the 2018 Holiday Catalog to make our own public transportation route. This way women won’t have to walk as far to get to our centers. Which means more access to critical health services for the most under-served in our corner of Northern Haiti. You’ll be hearing a lot more about neighboring health clinics this year as we increase outreach and collaboration with these important local partners. We recognize the need to work together to stop malnutrition in its tracks! A group of young people from our community will have a chance to participate in a sexual health course led by their peers! These Peer-Health Educators have already started receiving their train and are excited to continue to equip themselves over the next few weeks. We’ll soon be launching a new website that we hope will make it easier to learn more about Second Miles’ objectives and to stay informed on our progress towards those goals. Keep an eye out our new and improved look! With our refreshed sense of purpose and a strengthened resolve, we will continue working with families in Northern Haiti for healing and health, for recovery and strength, and for togetherness. We hope you’ll stay with us and help to forge a brighter future. Second Mile Haiti just broke ground on the Postpartum Unit at Strong Start Maternity Center. What’s a postpartum unit? And why are we building one? We’re building a postpartum unit because you can’t give women a safe place to give birth without also creating a safe space for them to rest, recuperate and bond with their new babies. But let’s back up a bit further. As you may know, Second Mile Haiti set off on a grand adventure last year when we announced plans to build a Maternal Health Care facility in Northern Haiti. The location for the new center was situated just down the road from our flagship facility, the Rehabilitation Center where we help children and their families during and after their recovery from Severe Acute Malnutrition. 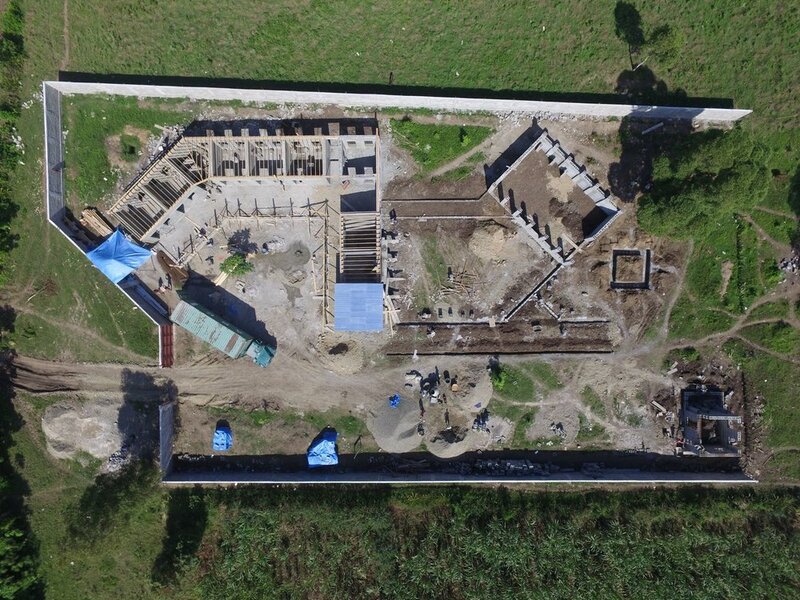 Bird’s eye view of the Rehabilitation Center. After 5 years of standing with families in this way, we knew we had to do something more to support families, and we needed to do this long before their kids got sick. Second Mile Psychologist, Staelle, at the recovery center with caregiver Odette whose daughter died while giving birth to twin girls Christine and Christella (not pictured). Through the help of many dedicated Second Mile supporters, the Maternity Center opened for prenatal care at the end of March. Currently, our staff of three dedicated Haitian midwives provide prenatal care and postnatal check-ins three days a week, while offering family planning to local families on alternate days. 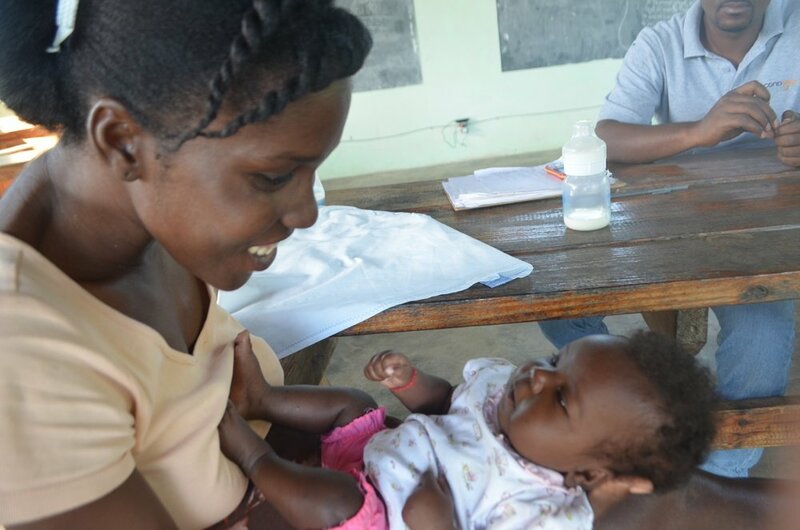 Head Midwife, Josephine Cossier, counsels a prenatal client at Strong Start. We know enough about why kids die to know how we can help them survive. We know that least 50% of those deaths are at least partially caused by Malnutrition and 75% of them occur within the first year of life. 2 We also know that malnutrition is 100% preventable and common childhood illnesses like pneumonia and diarrhea can also be prevented. Caregiver at Second Mile’s Rehabilitation Center models hand hygiene for her young sister. We know that babies born too early or too small are more likely to have health complications that could lead to their death. But we also know how to diagnose and treat many of the pregnancy complications that contribute to high rates of premature birth in Haiti. In other words, through prenatal care we can ensure that more babies stay in the cooker as long as possible. Finally, we know that an alive mother makes all the difference. Children whose mothers have died are 10% more likely to die young than children whose mothers are still living. How often is pregnancy deadly for women in Haiti? Too often. A woman in Haiti is at least 3,000 times more likely to die of pregnancy-related causes than a woman in the United States or Canada. A client at Strong Start gets her blood pressure screened to rule out hypertension and preeclampsia, a dangerous pregnancy complication. THIS. MUST. CHANGE. And you can help. We wouldn’t share the heartbreaking statistics if there wasn’t a way to change them. Skilled maternal-health workers save lives. At Strong Start, our three talented midwives have a combined total of 14 years of higher education and they are more than ready to step up to the crisis at hand. At Second Mile Haiti we are nearly ready to add labor and delivery to the list of services offered at the Maternity Center. But there are a few things we need your help with before we can begin. Now, I said there were a few things we needed your help with but really it comes down to just one. Here’s the thing, we would never promise to offer a service we couldn’t sustain. Monthly supporters are exactly that. Sustainers. If you truly want to get involved in changing lives become a monthly donor today. We also know that breastfeeding saves lives. But breastfeeding is hard. And it doesn’t always happen for mothers and their newborns on the first, the second, or even the tenth attempt. But here’s what we know. We know that mothers and babies who are able to establish successful breastfeeding within the first hour of life are infinitely more likely to have success in the subsequent days and months. That’s where the postpartum unit comes in. If you’ve given birth or know someone who has you may recall that feeding the baby is a big deal. Entire hospital are changing almost everything about what they do in the hours after baby is born so that parents and babies can get the breastfeeding thing down. Women in Haiti should have the same support… more support in fact, not less. The stakes are that high. You can help keep mothers alive….. and newborns alive….. and keep families together. Give today to help us finish. Are you interested in knowing more about what the deal is with Strong Start? How do we know there is even a need? What are women doing now for labor and delivery? Does prenatal care really make that big of a difference in keeping families together? Every few weeks we post a picture like this one. You get a nice aerial shot of bricks, and boards, and rocks and trees. And if you’ve been following along, these photos are exciting! But for some of you, these photos might leave you wanting more. More information! More progress updates! More answers! Who will we serve? What services will we offer? When will we start?! No fear! In just a few days you can hear the answers to these questions and more during a Facebook Live on Saturday, February 10th. Too many women don’t have access to quality maternal care and necessary education during their pregnancies. As a result, life-threatening complications like anemia, infections, and pre-eclampsia go undiagnosed and untreated. This affects not only women and the children they will bring into this world, but entire communities. The health of women affects us all! Today, thousands of Haitian women die each year as a result of pregnancy and childbirth. And one in 25 infants don't live past the first 30 days of life. We’d like to stop that. How will we make a difference and when will we start? 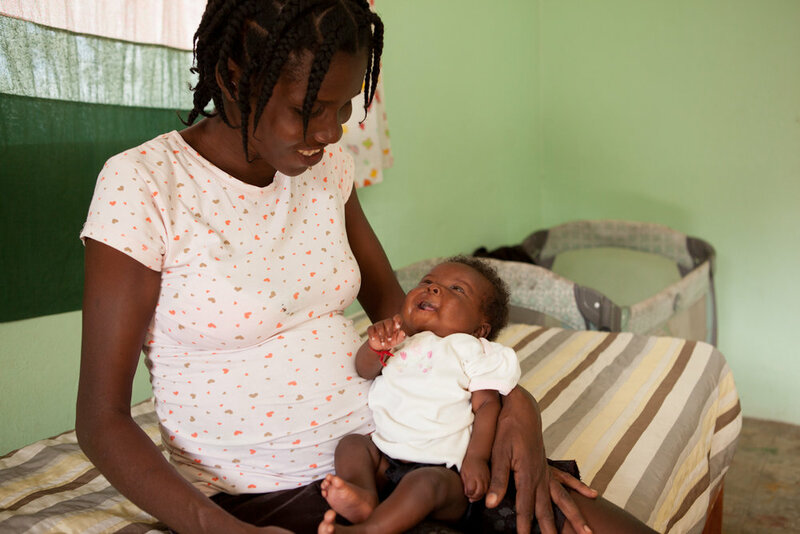 The Strong Start Maternity Center will serve women and families in Northern Haiti by offering quality maternal care-- identifying complications before it’s too late-- and providing care and follow-up for mothers and newborns in the critical postpartum window and beyond. We start on February 26th. Yes, this February. In just 29 days! We will start by providing prenatal care and education and eventually, we will open the birthing and postpartum unit. As they say in Haiti “piti piti zwazo fè nich li.” Little by little the bird makes it’s nest.” Only time will tell how fast and how far we grow. Here's the Prenatal Clinic. In this building there are four consultation rooms, one supply room/laboratory, one electrical room, and three offices. What will happen in each of this rooms? From Monday through Thursday pregnant women will come for their initial and follow-up consultations. Midwives will help women know how far along they are in their pregnancy, screen and test for complications, provide education, make a birth plan, and see to each women’s specific nutritional needs. We will be able to test for and treat anemia and common STIs to avoid the severe consequences these conditions pose for mother and child. We will be able to monitor and attend to women with high-blood pressure and provide special care for women with certain risk factors, including helping women access life-saving care when complications arise. Can you imagine losing your partner or mother because of an undiagnosed pregnancy complication? Can you imagine leaving your kids without a mother because you didn’t have access to a prenatal vitamin? During their visits both during pregnancy and postpartum, women can meet with a psychologist, discuss their health concerns, and get lactation support. Here’s what’s happening on site: The roof is being installed in three phase--- the first two phases are already finished! And by next Friday, the final phase will be complete. We started tiling the consultation rooms and offices this week. That too, will be finished at the end of this week. Next week, we will install the windows and doors and paint the rooms. By mid-week, next week, we will have started laying brick in the waiting area. And most importantly, the plumbing and electricity will also be finished by the end of next week. The goal is to finish the Prenatal Clinic completely by Feb 9th! Isn't that a lot of work?! Yes. But as long as we remember to breath in and out we can definitely pull this off. Alright, let's take the walkway, and head out to the Education Center. This lovely walkway will soon be covered in brick and provide passage from the prenatal waiting area to the education building. The cement work on the education building is nearly finished and we have been busy cutting out frames for the roof. We hope to start directing our attention to the roof next week. As you can see, the masons have been quite busy. Just look at those shiny, smooth walls! The Education Center is the heart of our efforts. We want women to have all the information they need to take care of themselves and their children. The center will be open for prenatal classes Monday-Thursday, new mother courses on Fridays, and on the weekends for family-oriented classes geared towards partners and support people. Imagine the Education Centre looking very similar to this image. Standing in the education center and looking back towards prenatal building, you can catch a glimpse of our Founder's Wall. We are so honored to be working alongside so many passionate individuals to make this dream a reality. This wall sets those partnerships in stone... pun intended. While the names have yet to be inscribed, this is where Strong Start's Founding Members will be able to find their names. "Founding Members" are monthly donors and anyone else who has contributed $250 to become a Founding Member. We still have several blocks waiting to be claimed. If you want to be a founding member, join us as a monthly donor or contribute $250 to the buildings here. We'll start inscribing names on Feb. 17th. And last but certainly not least: What about food and water? Do we have access to water? Will women and their families have access to healthy food on site? Yes and yes. We are working hard to finish two supporting structures: the Outdoor Kitchen and the Water Tower. The water tower is located next to the well we dug when this project was first getting start. A pump in the base of the well will pump water into a tank on the tower. The ground work for this system has already been laid, meaning just as soon as it's finished, we will have running water throughout the facility. 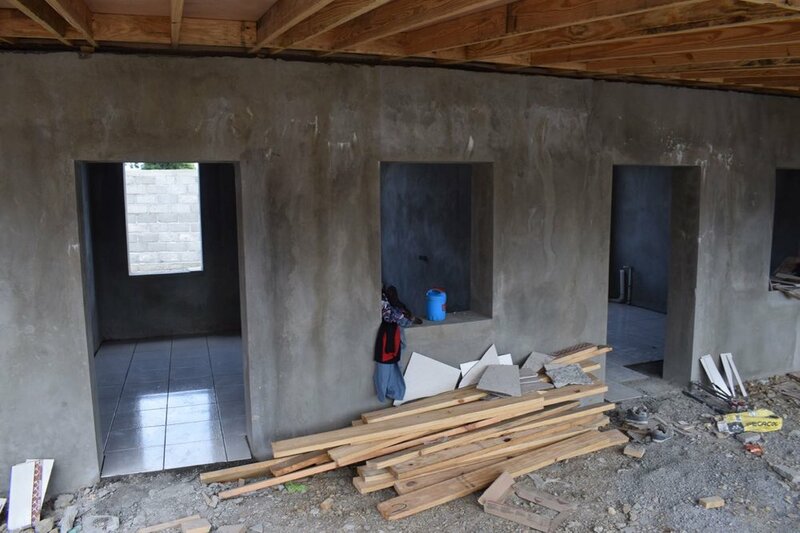 The outdoor kitchen will be a place that families can purchase meals at cost during pre and postnatal visits, during education classes, and even in the future when families come to the center to deliver. We will also be providing Chaya and eggs (a protein-rich, green snack) to all women who attend Prenatal Visits. Imagine the smells of rich, Haitian foods and groups of women nourishing themselves with a healthy meal. A courtyard eating area (not yet pictured) will be a lovely place to stop and sit for spell. The base of the site's storage room and water tower. As you can see, construction has been moving fast. Now that you’re up to speed, you may be wondering how you can help us prepare to open the center on February 26th. We still need the following items and/or donations to cover the costs of purchasing these items. We will buy an assortment of solar chargers and lamps to help provide addtional power. The massage tables, sold here in Haiti, will be used as patient exam tables. Want to contribute towards any of these items? We hope you enjoyed your tour and we hope to see you soon as a Founding Member of the Strong Start Maternity Center. If you want to receive news and updates, be sure to sign up for our newsletter today. We promise to send only the best to your inbox. Today, I'm ripping off the bandaid. It's been months since I've written a blog post, but the latest picture from the Strong Start Maternity Center--kind of demands an explanation. How did we get here?! This picture was taken on Thursday, December 7th. 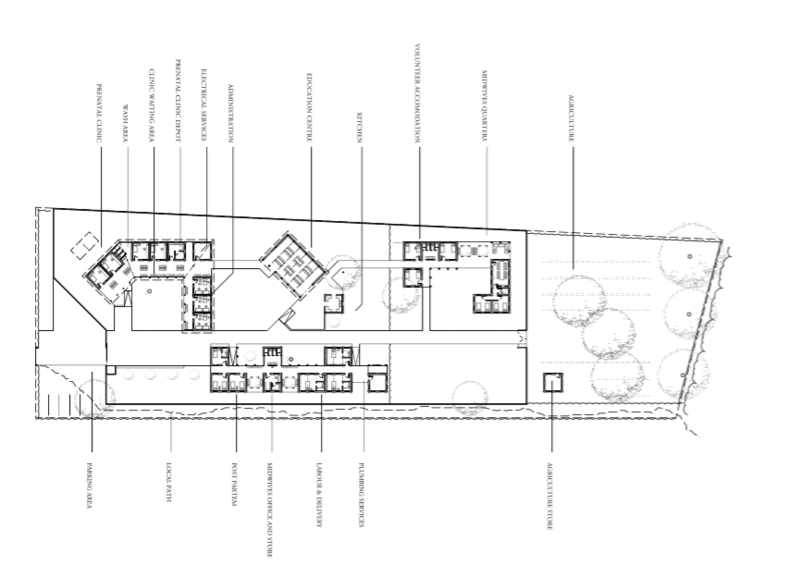 You can see the prenatal building, with offices and consultation rooms, and a path leading out to another growing building, the education center. And this picture was taken on September 9th--- just 13 weeks before picture #1. So really, how did we get here? That's a great question! Let's dissect. First I need to introduce Guylee. This will really help my explanation. If I had a list (and I do have a list), of the top 5 people that changed or impacted my life in 2017, Guylee would be (is) on it. So who is this mystery person? I met Guylee just "down the road" from Second Mile Haiti where he was working at a local hospital. He's an architect by trade and had been volunteering off and on in Haiti for the past 10 years. I know he doesn't look it, eh? You are probably wondering if he started in diapers. The answer is no, so you can stop wondering. Guylee is quite lovable, has an accent, is extremely talented at designing buildings, and has a gift for teaching. Guylee designs quality buildings (up to earthquake standards), but what he really wants to do is teach local masons and carpenters to build quality buildings. Did I mention he's from the UK and has an accent? The evolution of Strong Start, and my interactions with Guylee, started back in February. I decided to ask Guylee if he could draw up a site plan for the existing Second Mile property. You know, in case, we wanted to replicate our model or something. I wanted to be ready. Then in March, Amy and I had one of those "come to Jesus" moments. We knew it was time to expand Second Mile Haiti. But how? That was the question of the year. We were repeatedly doing what I like to call a "round table" conversation. You know, where you sit at the table and you go around and around until there's nothing left to do but "table" the discussion for the next time. Eventually, a series of discussions, and events, led us to our answer. We knew the Maternity Center was the next step. You can read here for the reasons. Perhaps you are one of the ones that thinks were crazy for starting something as new and big as a Maternity Center. It's okay, I am (a little crazy, that is). But if it helps, this wasn't an overnight development. Amy and I have never done anything without thinking about it for at least a year. This was actually a dream that started in 2014. I remember telling a friend then: "We will do it. This will happen." And here we are. It's happening. In April, the board passed our proposal. The need for a Maternity Center must have been pretty clear, or maybe we're just really good at convincing people to jump on board. Either way, that's when it hit me. We had voted. There were meeting minutes and a plan on paper. The Maternity Center vision had just gotten real. "Okay Guylee. Change of plans. We need to build a Maternity Center (insert hesitant chuckle here)." We started meeting regularly and coming up with plans. The plan we developed for the "board proposal" before we purchased land. This one was pretty, but no details yet. Between Plan 2 and Plan 3, we were visited by one of Second Mile's major funding partners and told that we would be receiving $100,000 for the construction of Strong Start. My thoughts went something like this: Woah! Amazing. Okay. Now we have to build this thing. It's real. Then we received an additional grant for land. And since we now had the land measurements, the plan, of course, had to change once again. Then came "the Ask." I didn't want to start building the Maternity Center without Guylee, but he was leaving Haiti. I had to ask him to stay. While I was planning for the next 3 months in my head, I had already done that. He had already said yes in my head, as well. But of course I needed to ask in real life. Just picture me mustering up the biggest "you-can't-say-no-to-this-face" grin you can imagine before asking "Can you stay for 3 months and oversee the first phase of construction?" In real life, Guylee decides to commit to a 3 month contract. We decide to dream big and pack as much as we could into those 12 weeks. 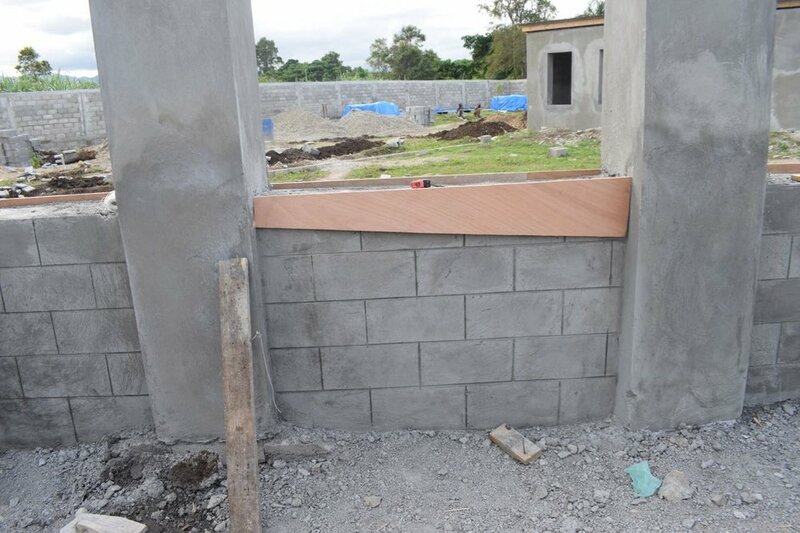 We make plans to build the perimeter wall, prenatal clinic, administrative offices, education centre, water tower, and kitchen, along with installing electricity and plumbing. So I might have left out one small detail. We couldn't actually start any of the above without first building a road from the Second Mile's existing location, to the land for Strong Start. There wasn't a passable road between the two locations. So while Guylee was away from Haiti during the first week in September, we built a road. I don't need to give too many details about what happened during the next 13 weeks. The pictures speak for themselves. We have been blessed by so many of you that decided to contribute. We were able to work for six days a week for three months straight without having to worry about a lack of funds. But the funds contributed-to-date have officially been spent. We will stop work at the project on Saturday (December 9th) until we can raise the rest. You might not believe this but to date, this entire project including land, road, and buildings has cost just $145,000. Can you believe it?? I wrote this yesterday on my Instagram and Facebook. "This might be the saddest day for Guylee and I in awhile. That truck just dumped the last bit of supplies we could purchase before the money ran out! I would say we did well Guylee. 79 days of work in a row without running out of money. We almost did it. Work stops on Saturday (Dec 9th) until we can find additional funds. We are extremely thankful to have arrived to this point in the project." Someone on Facebook asked me if this was an ask? As I reflected on this question, I realized I have so many emotions right now. "Secondly, I'm a little tired (because we did so much in such little time)." "Thirdly, it's a little bit of panic because Feb 26th is the date we have set to open the Prenatal and Education Centre to pregnant women and their families." "Finally, I'm feeling optimistic because it will work out. It always does." I'll leave with you with this final update. In order for us to finish the Prenatal and Education Centre, we need $19,739. Waiting on site, are all the roofing materials, blocks, and windows. They've already been purchased. The remaining $19,739 is $10,000 for labor and $9,739 for additional materials: doors, ceramic tiles, 250 sacks of cement, and electrical and plumbing materials. Today I’m interviewing Blaise Roosvelt. I have some questions for the person in charge of generating revenue for Second Mile's business program. Blaise is responsible for, Tou Natirèl (All Natural), the social business branch of Second Mile Haiti’s activities, and a project that came out of a desire to generate sustainable income, in Haiti, through food transformation. Success is strange. Most of us want to experience it, desperately even. But we don't all share the same definition. For some, success is the gold medal in the Olympic decathlon, for others it's running a mile. For many us, success is simply pulling our shoes on in the morning. When extreme poverty enters the equation, a successful week might be one where your entire family goes to bed every night with enough to eat. For others, success might be when this occurs just 50% of the time.